Welcome to another edition TC Daily. Was this forwarded to you buy a friend and you want to keep getting it? Great, subscribe now! If you are a cryptocurrency trader, you want safe, comfortable and private transactions. LocalCoinExchange facilitates peer-to-peer over-the-counter (OTC) trade of local currency for cryptocurrency with zero additional charges. Buyers on LocalCoinExchange, trade directly with sellers that have flexible rates and mode of payments. Many of the sellers accept Bank transfers, Paypal, credit and debit cards, cash, etc. Find out how to get started HERE. In the ramp up to its spin off from Naspers and listing on the Johannesburg stock exchange, significant management changes are happening at Multichoice. The most important change is that the new Multichoice group consisting of Multichoice South Africa, Multichoice Africa, Showmax and Irdeto will now be headed by Calvo Mawela, who used to be CEO of Multichoice South Africa. Some of you might remember him as the one who wanted Netflix to be regulated for dive-bombing DStv's pay TV turf. Naspers is apparently betting that it can help create the new Craigslist by audaciously backing Letgo, an American mobile classifieds app. And it's using its Tencent profits to do it. Article on the WSJ (paywall). Endeavor Nigeria has picked its first entrepreneurs. Etop Ikpe of Cars45, and Elizabeth Rosiello of Bitpesa. Endeavor is a global network that mentors and supports high impact entrepreneurs.The Nigerian affiliate launched in February 2018. In news from the Mogadishu Tech Summit which concluded yesterday, we hear that the chairman of Premier Bank has announced a $1 million fund to invest in Somalian startups, to be deployed in collaboration with iRise Hub. Kenya's Pesacheck is the latest addition to Facebook's growing cohort of 3rd-party factchecking organisations, according to Techweez. The African Youth Energy Innovator competition is now open to applications from young Africans between the ages of 18 and 35 who are creating solutions for the energy sector. Clickbait. If you've used Uber or Taxify in Lagos, you've definitely met all these types of drivers. If you aren't in Lagos and you still recognise them, hit reply to tell us where you are reading from. Meeting up with personal financial goals, from owning a home to building trans-generational wealth, is a desirable thing. Desirable but tough. 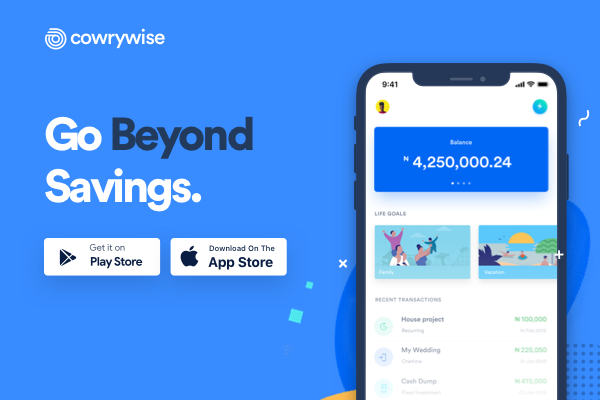 CowryWise makes it easier by helping you plan a unique and sustainable path to attaining your financial goals. This is done through convenient automated savings and investment. You can launch the pursuit of your goals with a simple click. Check them out here. Tell your friends about TC Daily. Copyright © 2018 Big Cabal Media, All rights reserved.